Preheat the oven to 170°C, gas mark 3. 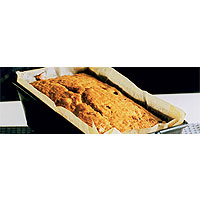 Line the base and sides of a 13cm x 23cm x 7cm (900g) loaf tin with baking parchment. Cream the butter and sugar until they're well blended. Break in an egg and beat it into the mixture completely, then beat in the other egg. Add the dried fruit and lemon zest. Mash the bananas and add them to the mixture. Stir well. Sift the flour into the bowl and carefully fold in. Scrape the mixture into the prepared tin and gently level the top with the back of a spoon. Bake for about 1 hour, but check the cake after 50 minutes. It's ready when you can insert a knife into the middle and it comes out completely clean. Leave the cake in its tin to cool on a wire rack for 15 minutes, then turn it out of the tin and peel away the paper. Keeps for 5 days.